Blind or POP rivets are one of the best tools for quickly and efficiently fastening two materials together. Blind rivets get their name because they are used when there is only access to one side of the material. Though efficient, this type of installation can cause problems when selecting a rivet to use. Why is having access to one side of a material a problem? Determining the rivet diameter is easy, but what about the length? The length of a rivet determines its effective grip range, or how much material it can effectively hold together. If you don’t have access to the second side of the rivet installation material, it can be a real pain to pick the right rivet. Having access to both sides of a material is something often taken for granted. It allows a user to easily install and gauge the size of the fastener they need, but often, both sides of the material are not available, and it causes two large issues. In the event of needing to fasten one material to another with a rivet, it is actually quite easy to determine thickness. 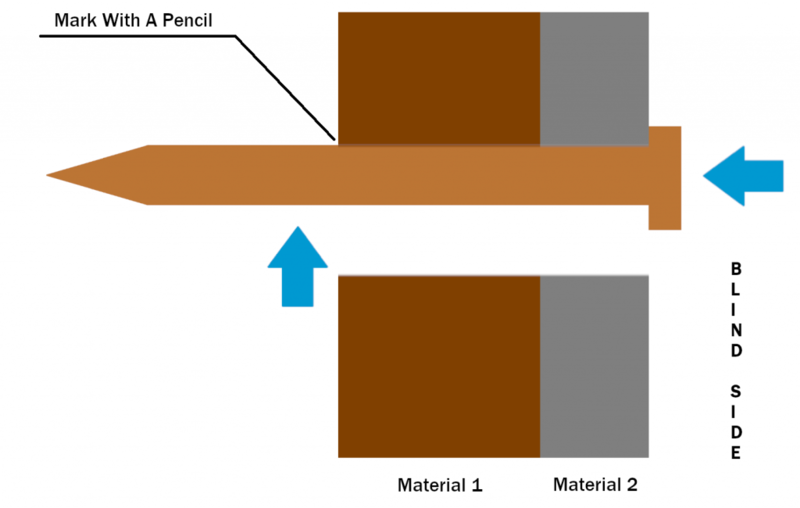 The problem is determining thickness when you cannot access the back of both materials. Material thickness can be easily measured when you have access to both sides. All you have to do is place the two materials against each other and measure them with a tape measure or caliper, or measure both materials on their own and add them together: Material 1 + Material 2 = Material Thickness. Once you have the material thickness you can figure out the grip of rivet you need. 1 Nail with the head smaller than the diameter of the drill bit. The first step is to line your materials up and determine where you will be putting a rivet. Mark that spot and use the drill bit to drill through both materials. Pull up on the nail and begin pulling it back out. It will catch on the inside material. Then, take the pencil / marker and mark the exposed portion of the nail where it enters the drilled hole. Now stop pulling the nail up and remove it from the hole. Using a tape measure or caliper, measure from under the head of the nail to the mark. That number is your material thickness. Now that we know the thickness, we can measure the diameter of the hole (or use the measurements from the drill bit if we know it) to determine the diameter of rivet to use. Using the thickness, we can determine the grip that we will need. For example, the hole is 3/16 inch in diameter and the measurement from the nail is 0.30 inches. This means that we would need a 6-6 rivet, which has a 3/16 inch diameter and a 0.251 – 0.375 inch grip range. For an added bonus, check out our Rivet Measuring Guide view rivet diameters and grips to determine the number rivet you need. Bob: Welcome back to Albany County Fasteners – Fasteners 101. I’m Bob, today we’re going to show you how to measure two pieces of material to receive a rivet. So let’s get started. So everybody’s asking “how do I measure material, in place, on a jobsite? How do I measure the two pieces of material for a rivet?” We’re gonna demonstrate to you here how to do it. Let’s just look at this as if it’s in place, and you can’t see the backside, but we’ll show you the backside. All you need is a nail or a screw, a flathead screw. Something that has some type of lip on it that you can grab the backside with. That’s what we’re looking for. You would put the nail in the hole and you just pull it. Then you take a sharpie or a marker and just pull on it, and then put a mark on you nail. You see, there’s the mark. Take a caliper or tape measure and then you would measure it. This comes out to about 0.478”. You can then find a rivet within that grip range. This is an 8-8. This grip range is between a quarter inch and a half inch. We needed 0.479″ which falls in that range. This rivet goes between 0.25″ and 0.50”. So I’m gonna slide it in. Take my tool, and I’m going to show you that this will work perfectly. There you go. It’s installed. The proper size. And that’s how you measure product when you can’t get to the other side. Looking For More Blogs Like This One? Sign up to get new blogs sent directly to your inbox! What Is Pozidriv? How Does It Differ From A Phillips Drive? Flame Resistant vs Flame Retardant – What’s Better? Well Nuts – What Are They And How Are They Used?